Just got an email with an offer to buy up to MVP Gold for 2019. I'm currently 500 miles short but have two flights before the end of the year so I'll be fine. Offer is to buy miles with either money or... miles! 1000 miles costs $275 cash or 27,500 miles. I can go all the way up to 10,000 miles for $1,400 cash or 140,000 miles, with 1,000 mile increments. Received email from AS offering to sell me EQM so I can maintain status. $775 for 5000 miles. $225 for 1000.
first time receiving such an offer. yesterdays flight will put us far beyond what was required. Now, next years quest for MVP is another matter. Last edited by dayone; Nov 29, 18 at 6:32 pm Reason: Delete circular link after merge. I just got the same offer. Strange thing is that I already re-qualified for MVPG a couple weeks ago, and according to AS am sitting at 44,754 AS-only miles for the year. Guess the list was generated and sent to the marketing team before then! Yup - I requalified for 75K a couple of weeks ago. For me, 1000 EQMs $300, and 10000 for $1650. It is a targeted offer. You can buy up to 10,000 EQM's for $1650 or 165.,000 miles maximum. This will definitely add to the pool of AS Elites. 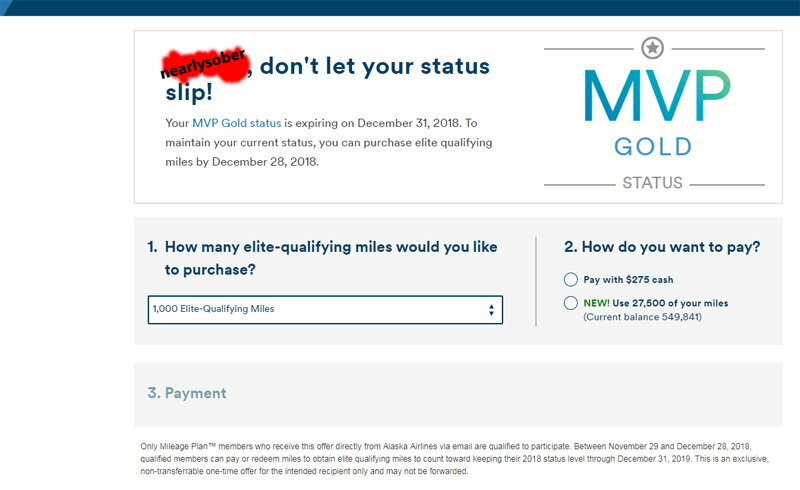 Not sure how I feel about the 10K mile option when I have spent a lot of time and $ to get there the "right" way.... Not sure why I got the offer since I am already 75K for 2019 on partner miles and will get there pure AS miles on Sunday. Also this "EQM miles are non-refundable and cannot be used toward award travel" so, they are useless except to obtain status. Yikes. I can use miles to buy miles. 75,000 miles to buy 5000 EQM. Same here; made MVPG BIS, would not allow me to buy enough EQM for MVPG75k - not that I would if it did. 10k maximum. I'm not troubled by this, because it isn't like they're giving it away. For $1650 or less (depending on where you're at), you could take a trip or two in F and earn the 10K. Instead, AS gets the dough and keeps the seat without any outlay. It also makes it nice for those either in an extremely expensive market or a market with not a lot of options (i.e., transcon only) to top off the balance without a huge dollar or time commitment. I recently spent a late afternoon / evening, spent $102, and got my last 1000 miles, so if some want to spend $300 for same, good for them and good for AS. Doesn't bother me in the least, quite appropriate. There are plenty of people who call AS with hard luck stories, looking for some type of accommodation, also those considering MRs to earn status - this addresses both issues. I WOULD be bothered if AS followed AA by issuing wholesale challenges, offering most anyone interested a shortcut to status. Screenshot of the UI below for those curious if you didn't get the targeted offer. Starts at $0.275 per mile (or 27.5 miles per mile) for 1,000. Location: Between BLi & SEA. I got one of these as well. We will catch a R/T next week to squeeze out our 40K for the year. However I am surprised by the offer as I have always thought that BIS was the only way to catch status with Alaska, other than a status match from another airline? I thought this part of the fine-print was strange too - doesn't seem right so I wasn't sure if I was reading it correctly. I guess this is purely just a way to pay to maintain status. I got one of these as well. We’ll catch a R/T next week to squeeze out our 40K for the year.